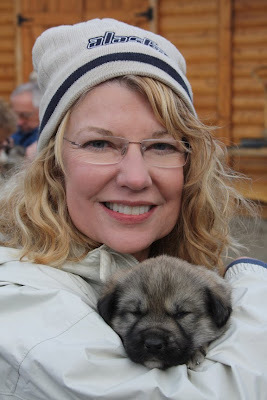 Me with a three week old Alaskan Husky. 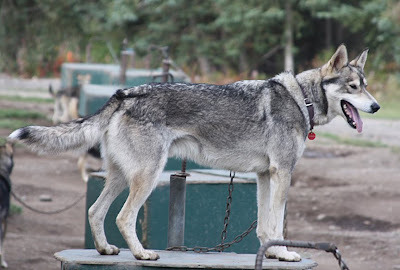 This puppy and full grown Alaska Husky belong to Jeff King, four-time Iditarod Champion. Jeff's wife, wildlife artist, Donna Gates King and one of his three daughters gave a tour of their homestead kennel. They do this tour in the summer tourist season to pay for the high cost of keeping 70 dogs. There is a special bond between dog and musher. It was interesting to learn the inside story. 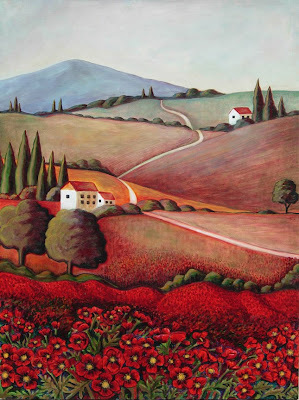 The painting of the poppies fields has replaced the Clemson tiger paw. Eric is married and this is the new look for his room. Now this room is for him and Christina to visit. I found the quilt for one fourth of the original price at Tuesday Morning, one of my favorite places to shop. 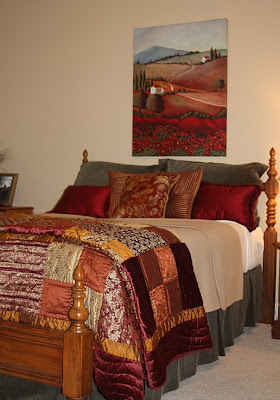 It is fun to find pillows and create an original bed ensemble. The green is from his original linen set. The bedroom set also has some history behind it. It was purchased in about 1971 by Eric's grandmother on his father's side for us to inherit. So we have kept it for sentimental reasons.